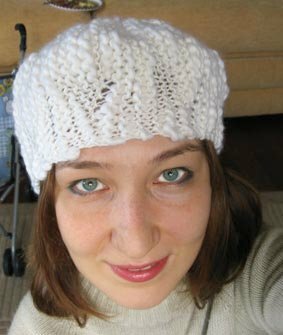 Yesterday evening I cast on for Urchin hat from knitty.com online knitting magazine. I frogged couple of times because I tried to use the w&t (wrap&turn) method as described in Vogue Knitting: The Ultimate Knitting Book . I had to give up being stubborn and I carefully read the instructions for w&t on knitty.com. I used for the second time in my life a row counter to keep track of my W&Ts. And Barbados from Alize yarns is so gorgeous, so soft. I like a lot this thick and thin yarn. My gauge was 13 sts/4 " and I used 7mm knitting needles. it is really pretty. I've had my eye on this pattern for a while.